Sam Houston State University president James F. Gaertner and Angelina College president Larry Phillips signed an articulation agreement on Wednesday (Dec. 1) that allows students to hold joint admission at both institutions and make transferring from AC to SHSU easier. The program is designed to encourage AC students to complete associate degrees before transferring to Sam Houston for a bachelor's degree. Similar agreements have been signed with the Blinn and Montgomery college systems. The agreement will allow AC students to access over 30 articulation agreements for more than 40 different degrees at the two schools. In addition, AC students will be allowed to have SHSU ID/Bearkat OneCards, access to Sam Houston sporting events, use of an SHSU e-mail account, and access to the SHSU library and campus computer facilities while they earn their associate degrees. The two colleges' financial aid departments will work together to make financial aid transfer between the two institutions as convenient as possible for students involved in articulation agreements. For more information about the agreement, call David Burris 936.294.1568. Sam Houston State University has extended the demolition schedule for the Gintz Family Apartments by 10 days, with a move-out date of June 10 instead of June 1, and the university will have space available for displaced residents in another campus housing unit. The move-out date has been postponed from its original date because the university wanted to "be aware of when Huntsville ISD lets out and so that [students] are done with finals to give [them] time to move," according to Heather Thielemann, vice president for enrollment management. The university has worked to provide assistance to the residents of Gintz who may be having problems finding suitable, affordable living arrangements, and will allow the residents to move to the Colony Apartments, according to university president James F. Gaertner. However, the move to Colony Apartments will also come with a rent increase of about $100 a month, which is the rate charged to students already living there. Gaertner said that the university decided the Gintz apartments have safety issues because of their age and that their renovation would not be cost effective. And while the university does have plans to replace Gintz with newer housing, there is nothing definite at this time. Thielemann also said that modifications, such as child protective barriers on the bottom floors, childproof porches and a play area, would be made to the Colony Apartments to accommodate families with small children, though a start date has not yet been established.
" We are honestly working hard to see that we don't displace people and that we treat people as best we can, so this is about as good as we can come up with right now," Gaertner said. "I think [residents] have been very understanding so far. It's not pleasant to be displaced, but I think they realize that we are trying to help them as best we can." The SHSU symphonic choir and orchestra will bring you “home for the holidays” with a concert including classic Christmas carols on Friday and Saturday (Dec. 10-11). Performances will be held at 7:30 p.m. each day in the University Theatre Center. SHSU music faculty members Kristen Hightower and Mary Kay Lake will be featured singing soprano solos and Andrew Wilson will perform a violin solo at the event, conducted by faculty members Allen Hightower, director of choral and vocal studies, and Carol Smith, director of orchestral studies. Tickets for the concert are free for SHSU students, faculty and staff with an ID, as well as children 11 and under, are $8 for adults and $5 for senior citizens. On Tuesday (Dec. 7), area coordinator of wind and percussion Matthew McInturf, accompanied by graduate assistant Wes Robertson, will conduct a wind ensemble concert. The performance, which will include such songs as “George Washington Bridge” and “Ballad for Band,” will be held at 7:30 p.m. at Mance Park Junior High auditorium. To help ease some of the stress from final exams, the Department of Recreational Sports will host a “Finals Relief” at the Health and Kinesiology Center on Monday (Dec. 13). The event will be held from 8 p.m. until 1 a.m.
Rec Sports will provide food and drinks, 10-minute massages, games and prizes, hourly aerobic breaks, and a lot of study space. For more information, call Tina DeAses at 936.294.1985. The SHSU Student Government Association has officially launched its book exchange Web site, which will allow students to save money by buying and selling their used textbooks from their fellow Bearkats. Through the Web site, www.shsubookswap.org, students can list their used textbooks online, as well as search for needed books. When a needed book is found, contact information for the person who listed the book will be provided, and a sale is done between students. The site is offered free of charge and open for all students to use. For more information, call the SGA office at 936.294.1938. The Office of Multicultural and International Student Services will celebrate a successful semester of the SAMentors program with a “Whimsical Winter Gala” appreciation banquet on Tuesday (Dec. 7), from 7-9 p.m. in the Lowman Student Center Ballroom. “ We went from 100 to 200 (participants) this semester,” said MISS program coordinator Jennifer T. Roberts. “The program is becoming very successful because the mentors are really enjoying giving back to their protégés all of the study skills and skills of living at Sam Houston as a successful students and as a leader. The banquet will mark the conclusion of the program for the year and will include a graduation ceremony for the 2004 cohort of freshmen protégés. “ They’re really excited about that because I think the completion of the first semester is really essential and the retention for the program has been really high as well,” Roberts said. In addition, MISS will honor a mentor and protégé “of the year;” will recognize those who have completed a “star chart,” which requires student mentors and protégés to visit various departments to find out about campus services; and will also recognize those who completed three or more of the Multicultural Awareness Certification programs. The banquet not only gives students closure to a mentor-protégé relationship for the semester, but allows MISS to show their gratitude for the mentors’ volunteering to create relationships that often last until the protégés senior year, Roberts said. Because of the program’s expansion, MISS will begin interviewing for next fall’s mentors earlier this year, moving interviews from April to February. Anyone interested in becoming a SAMmentor can call 936.294.3588. Work by Sam Houston State University’s graphic design students is currently on display at the Texas Prison Museum. After researching and visiting the Texas Prison Museum, interviewing its director, Jim Willett, and exploring the museum’s holdings and history, assistant professor of art Chuck Drumm’s “Graphic Design IV” class redesigned the museum’s logo and incorporated it into stationery sets. In addition to these designs, the students also redesigned museum display cases and signage and created direct mail pieces for the museum’s Sesquicentennial Plaza brick pavers program. Although the Texas Prison Museum has no immediate plans to change their existing logo, Willett attended several class critiques on the students’ projects and expressed delight in the creativity of the redesigns. The Texas Prison Museum is located off Interstate Highway 45, at Exit 118. A student checks out the many items at last year's pottery sale. 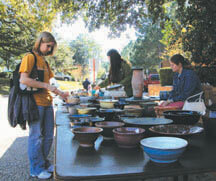 The SHSU art department’s Clay Club will be having a pottery sale on Dec. 7-8, from 9 a.m. to 3 p.m. daily. The sale will be held in the Lowman Student Center Mall Area on both days. The pottery sale will feature creative and functional work by students and faculty. The Clay Club raises money to expand student's education in ceramics through visiting artists, conferences and workshops. Sixty percent of the funds raised per item goes back to the artist, with the remaining 40 percent benefiting the organization. For more information, contact Cory Cryer at 936.294.1322. Students, faculty and staff will have the opportunity to go head-to-head in the Kat Klub’s last two Texas Hold ‘Em tournaments of the fall semester on Tuesday and Wednesday (Dec. 7 and 8). There will be a different tournament for each night to allow more participants to play, according to Gary Roark, Kat Klub director. The tournaments have been very popular throughout the semester, Roark said, and will be held from 5-9:45 p.m. both days in the Kat Klub, on the first floor of the Lowman Student Center. “ It is really crazy the way this has happened,” he said. “I was only going to do one a semester, but I have so many people wanting to play that I’m having to do it every first and third week, twice a week. Maureen V. McIntyre, professor of theatre has been invited by the third annual Hawaii International Conference on Arts and Humanities to present her research paper, "Changes in Perceptions of the Needs and Sophistication of the Child Audience in American Children's Theatre: From Protected Innocent to Conscious Participant in a Harsh Reality." “ I was inspired to write the paper by the past 25 summers as director of the Huntsville Children's Theatre festival, the wonderful Huntsville children and the changes in available subject matter for children's theatre,” McIntyre said. Co-sponsored by The Asia-Pacific Research Institute of Peking University, The East West Council on Education, and The University of Louisville’s Center for Sustainable Urban Neighborhoods, the conference will be held at the Sheraton Waikiki Hotel in Honolulu from Jan. 12-16. Submissions to the conference were solicited and reviewed from a broad range of academicians and professionals from arts and humanities related fields from many countries. Last year, more than 1100 people from over 40 countries attended the conference, the primary goal of which is to provide an opportunity for academicians and professionals from arts and humanities from around the world to gather and interact with a variety of disciplines. In addition to presentation at the conference, the paper will be published on CD-ROM and on the conference permanent Web site. McIntyre, who said this event will be the first international conference she has ever presented at, is the lead author on the piece. Her co-author is her former student, Shelley Fitze, a published playwright whose professional name is Lane Riosley.